It is a rite of passage: January and the annual Macworld review. This January the Pi’s General Meeting was packed with members and visitors eager to hear about what was said, shown, demonstrated, poked, prodded and promised. Such interest is, itself, is extraordinary, since it wasn’t always this way. When the first Macworld Expo came on the scene in 1985, it was a novelty: a computer show dedicated to just one computer: the Macintosh. The Mac was just a year old, and a relative newcomer in a complex microcomputer ecology. Microcomputers were running CP/M, MP/M, CP/M-86, Apple DOS, MS-DOS, AmigaOS, Sun OS, GEM, TOS, ProDOS, SOS, TRS-DOS, Xenix, and a host of other operating systems even more obscure, but not Windows, which didn’t exist. Just to illustrate how strange this strange world was, Apple supported several of these operating systems -- on the Apple II. Steve Jobs, in the middle of a fight that saw him booted out of Apple management, made regular public statements to the effect that the Mac did not even have an operating system; a Macintosh was just a Macintosh, and not really a personal computer. It was something even better: a Mac. Nearly a quarter century later, the Macintosh survives. In fact, it is the sole survivor of this age. Steve Jobs has at last acknowledged that the Mac operating system exists, and his return to Apple late in the last century saw a profound rebirth of the Mac operating system as Mac OS X. 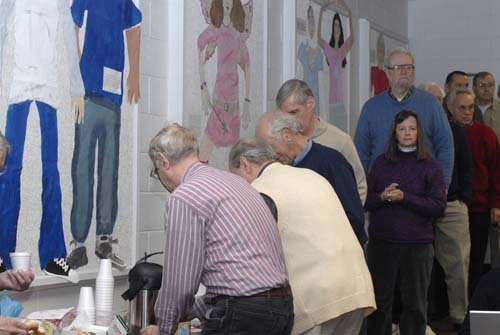 Why did so many people attend the January General Meeting? Because Apple has survived, and thrived, and so has the Mac. The annual Macworld review is an opportunity to get together and do something different: look into the future. You might say it is one of the better windows into the future, with a vista of Mac OS X. Another question dealt with problems printing with Safari. These tend to be caused by junk caught in Safari’s cache, and can be overcome by going to the Safari menu and selecting Reset Safari. Note that this gets rid of cached files, history files (where you've browsed) and cookies. Another user wanted to move files from a PowerMac G3 blue and white to a new iMac. He tried to use FireWire “target mode,” but the blue and white does not support target mode. Could he just replace the Users folder on the iMac? Unfortunately, no: this would be a bad idea. Rescue documents and such, but don't even think of replacing a Mac OS X 10.5 Users folder with a Users folder from an older operating system on another machine. Another user wanted to use a new external drive as both a bootable hard drive and a Time Machine storage device. Was this a good idea? It will work, but it isn’t really a good idea. By booting from your Leopard installation DVD and restoring from Time Machine, you get the same result without losing space on an unnecessary boot partition. Pi President Bob Jarecke then spoke for a few minutes, sporting a new long-sleeve T-shirt with the new Pi logo on the front and back. He mentioned that we are looking for a local dealer that can produce all types of logo paraphernalia we can offer on the Pi Online Store. Bob congratulated Allen Kent who submitted several photos for use on the cover of the next edition of the Journal (the one you are reading). Allen’s unique photos provided just what was needed to produce an interesting, eye-catching cover. Allen was rewarded with a $15 iTunes gift card. Bob next mentioned a new initiative. The Pi is looking for someone who might like to become the "Pi Reporter." This person would search out stories for the Journal and Web site as well as cover Pi events such as the General Meeting. If anyone has an interest or an idea of what they could do in this area, they should contact Bob at president@wap.org. Finally, a change to the Pi's Bylaws was addressed. As part of a yearlong updating of the bylaws, the Board proposed a change that gave it more flexibility in using modern telecommunications to conduct Board business. The change, to Article VII of the bylaws, was approved unanimously. A large crowd gathered for the annual Macworld review, resulting in a long line for coffee and donuts. Photo by Richard Sanderson, taken with a Nikon D-200 digital camera. Coffee and donuts were next. Two airpots of coffee and dozens of donuts disappeared. Meanwhile, dozens of very intent conversations and discussions broke out. Pat Fauquet offered a slideshow of photos she took at Macworld but the conversations were so engrossing that many never noticed and missed, among other things, some of David Pogue's latest parodies. Presenting Apple’s view of Macworld Expo was Aaron Davis. Aaron is Apple’s regional education manager, and he commented that, in seven years, he must have made 200 presentations to regional groups, but this was his first visit to the Pi. A packed, attentive, curious and questioning audience greeted him with almost unnerving attention. Aaron began with a review of Apple’s progress over the year. By almost any measure, the company is clicking on all cylinders. The company has over $18 billion in cash in the bank, iPod and Mac sales are soaring, and Apple is the third largest distributor of music – online or on disc – in the world. Over four million iPhones have been sold, which not only boosted Apple’s bottom line but that of AT&T. The stock markets greeted this robust news by promptly crashing, but that had more to do with the imploding mortgage market and massive deficits than with Apple's stellar performance. Aaron then went on to review new Apple offerings announced at Macworld. He dutifully mentioned movie rentals (of mild interest), new software for the Apple TV (more interesting), and updates to the software on the iPhone and the iPod touch (complete with spontaneous rave reviews from members who had used the updated software). [Time Capsule front and back. Photo courtesy Apple, Inc. The two most important announcements, however, were radically dissimilar. On the one hand, there is the understated, unsexy Time Capsule, which looks for all the world like an Airport Extreme or an Apple TV or a Mac mini: yet another small white box with rounded corners. Yet this innocent-looking box, combined with Leopard's Time Machine, is a genuine revolution in computer security. 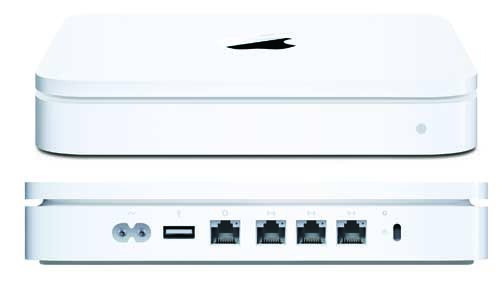 Not only does it combine the firewall, broadband router, wireless router, USB hub and Ethernet switch capabilities of the Airport Extreme, but it also adds in either a 500-gigabyte or one terabyte hard drive. A Time Capsule can connect your home or office computers to the Internet, either wired or wirelessly, can keep out bad guys coming in over your broadband connection, can share a printer or hard drive with others on your network, and can -- with no user attention at all -- automatically back up every computer running Mac OS X 10.5, wired or wirelessly, via Time Machine. This is one clever box! 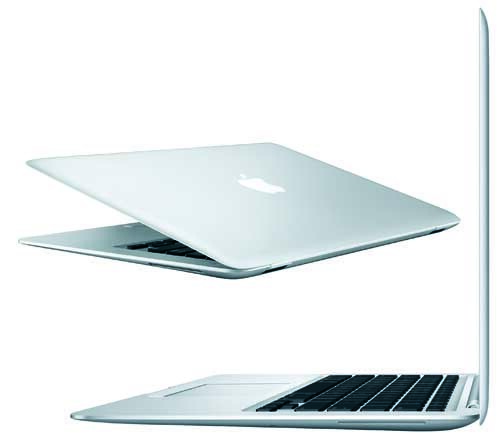 Two views of the MacBook Air. Photo courtesy Apple, Inc. The second big announcement attracted most of the media attention, and it was a big announcement because it was: light. While not quite as light as air, the MacBook Air is a far cry from Apple's first Mac portable, the 16-pound Mac Portable of 1989. The Mac Portable cost $6,500, had a megabyte of RAM, and ran at 16 MHz. The MacBook Air is three pounds, comes with 2 gigabytes of memory, and runs at either 1.6 GHz or 1.8 GHz. And for the price of one Mac Portable, you can get 3.6 MacBook Air computers, starting at $1799. Even three MacBook Air computers combined weigh in at half the weight of the Mac Portable. While some computer analysts claimed it is "too limited," for many this light, sleek objet d'art may well be the first genuine portable Mac ever made: light enough to take anywhere, but with a screen and keyboard large enough to be useful. You can use it as a portable extension of your desktop machine, or for typing in lengthy manuscripts on the subway (ignoring the poor people thumbing away on their Blackberries), or almost any other use except, perhaps, video editing. True, it doesn't have an internal CD-ROM or DVD disc drive, but this is just another in a long list of features that Macs have introduced (3.5 inch floppies, internal CD-ROMs, internal DVD drives) and then, eventually, evolved beyond. You can even get a MacBook Air without a hard drive, replacing it with a no-moving-parts Flash RAM drive. Aaron didn't have a MacBook Air at the meeting, but since then they've shown up in local stores. You need to see and touch one before making any judgments about the MacBook Air: it is so light it is shocking, and yet the full-size, illuminated keyboard puts that of most larger, heavier laptops to shame. 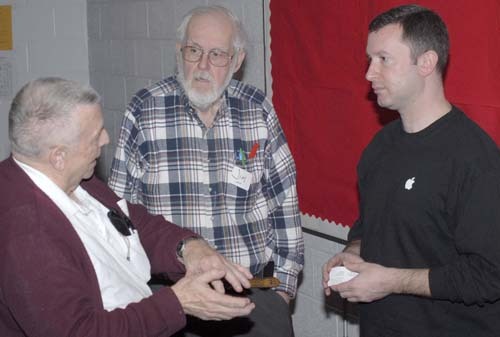 Aaron planned to spend the bulk of the meeting reviewing Mac OS X 10.5 Leopard, and was somewhat dismayed to learned the entire November 2007 General Meeting had been devoted to Leopard. He then asked how many people were using Leopard, and roughly half the audience raised their hand. Did people really want to see more on Leopard, he asked? Yes, people did. They wanted to see much more, and they wanted to ask questions, and they wanted to see how things worked. If the Pi hadn't committed to leaving the building at 12:30, the audience seemed more than willing to keep Aaron there indefinitely, asking questions, watching him illustrate answers, raising reservations about certain features -- and then ditching the reservations one they saw Leopard in action. One surprising area of interest was Quick Look, the document preview function built into Leopard. Aaron fielded a flood of questions about various things that can be previewed, and he responded by using Quick Look to preview things, including, as it happened, many things at once. The question was: "Can Quick Look preview many photos at once?" Aaron responded by selecting a directory of photos and asking for a Quick Look of the contents. A very iTunes-like "Cover Flow" view popped up, and the audience was suitably impressed. Apple’s Aaron Davis found himself surrounded by eager questioners even during the breaks. Photo by Richard Sanderson, taken with a Nikon D-200 digital camera. Time Machine, predictably, attracted the most questions. There were skeptics who didn't believe backup could ever be that easy. There were skeptics who didn't believe Time Machine was a "real backup." Aaron addressed such skeptics directly: he fired up Time Machine, briefly covered the (very simple) controls, and then deleted a file from his laptop. Less than a minute later, he recovered, almost effortlessly, the deleted file by fetching it back from the Time Machine backup. Even the skeptics came away impressed: Time Machine makes backup about as painless as it gets. The meeting closed with a drawing for a full copy of Mac OS X Leopard. Registration numbers were entered into the Pi Programming SIG’s creation, Raffler, and with little fanfare it picked the winning number. Hal Cauthen leapt to his feet and came forward to claim his prize. Hal has been pondering getting Leopard for some time, and need ponder no longer. The third week of January features Macworld Expo in San Francisco, and the fourth week features the January General Meeting and the annual review of Macworld. Aaron Davis, a Senior System Engineer with Apple, will be our speaker. Aaron will be presenting for an hour and a half and will provide an Apple Corporate update, review Apple products announced at MacWorld, and provide demonstrations of cool features of Mac OS X 10.5 Leopard, iWork '08 and iLife ’08. Of course, he will be taking your questions, too! In addition, we will have our usual Question & Answer session to start the morning, and unConferences with coffee. There will also be a vote on an important Bylaws change. And, we will be raffling off a copy of Mac OS X 10.5 Leopard too! The meeting promises to pack the room, so come early to claim your seat. The meeting will begin at 9:30 and will wrap up between 12 and 12:30. 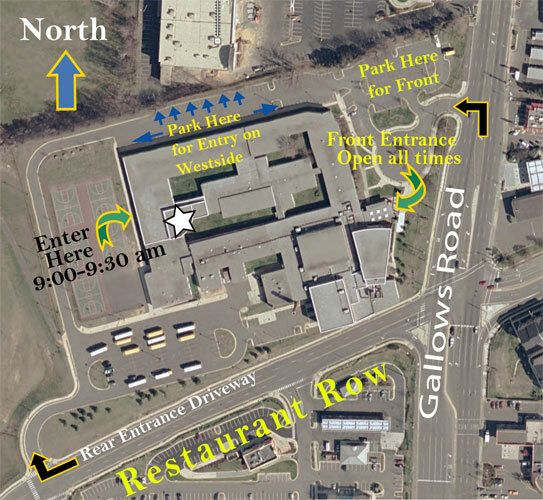 The address is 3020 Gallows Road, Falls Church, VA. Check out the directions and location map at link below.